You must have it wrong, Frank said he was decluttering. So Frank noticed over the past year and a half an emerging trend that woo peddlers have been hucking trading bots, quite astute that one. Yeah, he's wired directly to trends alright. Calabro back with more nonsense. Maybe he should address how many times he has profited while failing others? Yes the haters who expect people to operate within the law. Click https://www.sosnc.gov/vs2010/Soskb.W...o_redacted.pdf to view the Temporary Order. 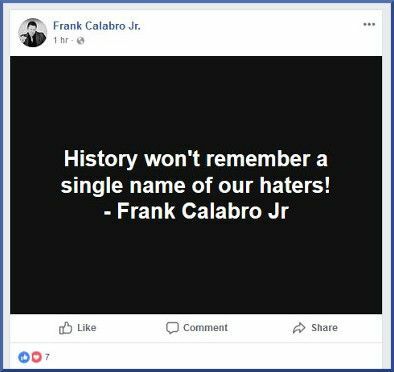 Seriously, who could be bothered wasting time on "hating" a low level pimp like Frank Calabro ??? He's like the cartoon version of a successful ponzi / pyramid scammer. Soapboxmom, shipdit, Della Cate and 4 others like this. He does for a change actually have a point. History always remembers the rogues and criminals. Take Charles Ponzi himself as a fitting example. of course the SEC who hate so much will remember your name.......every time it comes up involved in scam after scam after scam. they won't be able to get away from it. Soapboxmom, EagleOne, shipdit and 4 others like this. I have height requirements in order to hate. Wittle TURDie Calabro, Jr is not tall enough to go on the roller coaster= laugh at...not hate. Frank obsessed with six haters writing about his scamming as if he's been exposed on 60 Minutes. In Frank's world "mistakes" are synonymous with collapsed Ponzi Scams where people went to prison. It's counterintuitive to proffer any "hater" is labeling Frank's massive destruction of other people's wealth as success. Hater: USI TECH is a scam, don't invest. Frank has of course removed offers that have imploded and replaced them with yet to implode offers. On a good day if you think you are going to make profits trading Forex you're an idiot. If just one of the people promoting the FX Offer has previously promoted other trading schemes you're a huge idiot. Alecio is credited as one of CPS Global’s “select partners”. This fool must hate his own company then. What a comedown for Foolish Frankie Calabro. 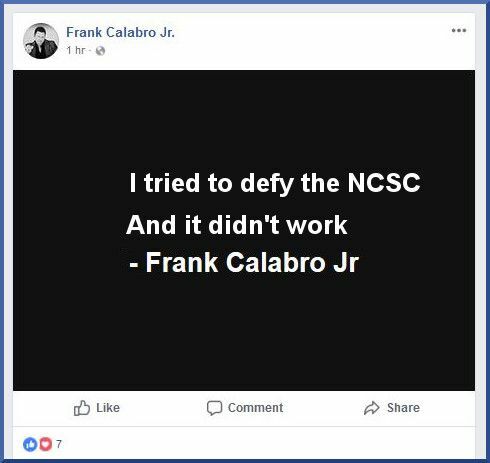 "Rather than clear his name with evidence he isn’t a serial scammer, Frank Calabro Jr. has agreed to stop committing securities fraud in North Carolina. As per the order, Calabro has agreed to permanently cease and desist from violating North Carolina’s securities laws. The order is dated June 12th, upon which date it became “final upon entry and … binding upon Calabro”. Here’s the thing though, Calabro Jr. is still promoting unregistered securities." "As I write this, three days after Calabro Jr. agreed to stop promoting unregistered securities, no less than three unregistered securities offers are being promoted on Planet Millionaire." shipdit, surfer, Della Cate and 2 others like this. ponzi midget thought he could hide behind the dime laying in the street. Whip, shipdit and Bestbud like this. Looks like CWE must have "rocked" when it should have "rolled"
Well, the authorities cannot say they didn't know that Frank has not given up his Ponzi pimping ways because they were notified that he is in violation of his consent he agreed to in his cease and desist order. Now let's see if the authorities take further action against him. littleroundman, shipdit, Char and 3 others like this. Doesn't really matter what Foolish Frankie says or does from here on in, anyway. His name, reputation, Cease and Desist notice and abysmal record of picking unsuccessful ponzis are all over the 'net. He'll retain enough interest from his list of confirmed ponzi players to give the illusion he's well known and respected. EagleOne, shipdit, Della Cate and 3 others like this.